Brownies are a popular dessert that you can make for a variety of occasions, ranging from casual children's birthday parties to more mature adult gatherings. Brownies have a rich, sweet flavor due to the fat and sugar they contain, so overindulging in this treat may not be ideal for your overall health. However, brownies are relatively low in calories, so you can enjoy them in moderation. Brownies are moderately low in calories, as a 35 g brownie contains 128. That amount comprises 6.4 percent of the daily recommended intake of 2,000 and makes brownies lower in calories than some other desserts, such as a slice of ice cream cake, which contains 240 calories. If you're trying to lose weight, you can burn the calories in a 35 g brownie through 13 minutes of jogging or 26 minutes of playing volleyball. Fat provides a significant portion of the calories in brownies, as a 35 g brownie contains 5 g of fat, or 35 percent of the total calories, as fat provides 9 calories per gram. Of the fat in the brownie, just 1 g comes from saturated fat, a type of fat considered less healthy because it can increase your risk of high cholesterol levels. 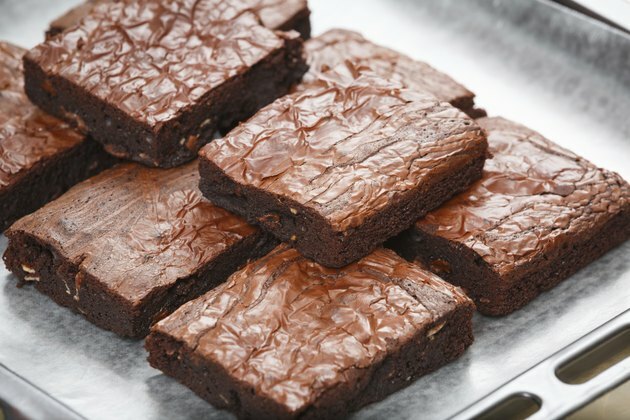 Brownies are rich in carbohydrates, with 20 g in each 35 g brownie. Carbohydrates are your body's primary source of energy, so the National Academies suggest consuming at least 130 g of carbohydrates per day. While carbohydrates can be helpful for fueling activity, you may find a low-carbohydrate diet beneficial for weight loss. Unfortunately, most of the carbohydrates in brownies come from sugar, a simple carbohydrate. Simple carbohydrates supply a short burst of energy but you may feel fatigued afterward, so high-sugar foods aren't ideal for endurance exercise. Too much sugar can also promote tooth decay. Brownies are not a rich source of protein, as a 35 g brownie provides only 2 g. That amount is 1/4 of what a cup of milk provides. Protein helps build and maintain your body's tissues, and you can find protein in dairy, meat and seafood. Brownies are relatively low in cholesterol, with 18 mg in each 35 g brownie. Consuming too much cholesterol can increase your risk of heart disease, so the National Heart, Lung and Blood Institute recommends a daily limit of 200 mg.